Check out Lindsay and Steve’s wedding on August 7, 2010 at the Deerhurst Resort in Huntsville. It was a great day as you will see. If you have been reading my blog over the past couple of years you will know how much I love Muskoka weddings and the Muskoka region itself. Lindsay and Steve travelled from the U.S. to have their wedding here and I was thrilled they asked me to be a part of their special day. The G8 Summit was held at the Deerhurst just a few weeks prior. Lindsay had 2 bouquets courtesy of EventDecorator.com. This one was made out of exquisite broaches and ribbons and such – I had never seen anything like it. Absolutely lovely and super creative. L & S opted for “First Look”. What is this? It’s when the bride and groom opt to see each other (alone) before the ceremony for personal time together and a mini photo session. Steve was gracious enough to cover his face as Lindsay was coming up the hill before she was revealed to him. This is more an American thing, but is ever so slowly becoming more slightly known in Canada. This was the cover photo on their album (which I’ll be posting soon). Steve didn’t know I was taking these – tee hee. 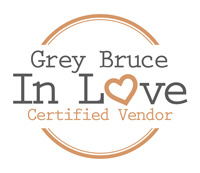 Loved the Bruce County fudge at a Muskoka wedding. Super cool wedding cake courtesy of The Caketress – Lori Hutchinson. The broaches and purple ribbon on the cake are all actually icing. Incredible talent! “DJ Danny D” of the best radio station in the world (Z103.5) was spinning his awesome tunes at the reception. I’ve been listening to that radio station since grade 8 (back when it was located in Orangeville) and I’m not sure if I’ll ever out grow it or not! Love wedding slideshows. High school sweethearts. wow..these pictures are amazing..it makes the picture more beautiful and sweet to look at..
the way the shots look, this is a work of art..one look and it catches all your attention.